Last week, we highlighted how important it is for companies to take a moral stand but it seems many businesses are weakening their brands by putting pressure on employees to act unethically. 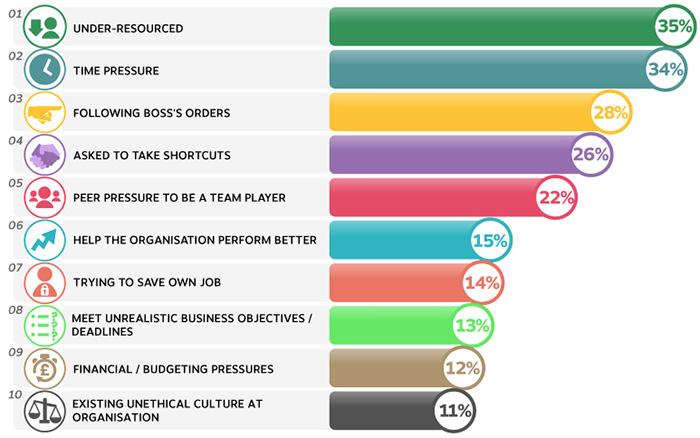 This is according to analysis by Reboot Digital Agency of the latest statistics from the Institute of Business Ethics, which surveyed UK employees to see if they had compromised their organisation’s standards of ethical behaviour and if so, what were the ‘pressures’ that pushed them to do so. The survey found that 12% of workers have broken their current organisation’s standards of ethical behaviour. Analysis was by Reboot Digital Agency of the latest statistics from the Institute of Business Ethics, which surveyed 764 UK employees.